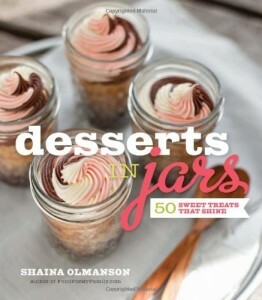 This recipe from Desserts in Jars: 50 Sweet Treats that Shine takes hardly any time to whip up, although it does need to be made a day ahead so it has time to freeze into a luscious, cool summertime dessert. 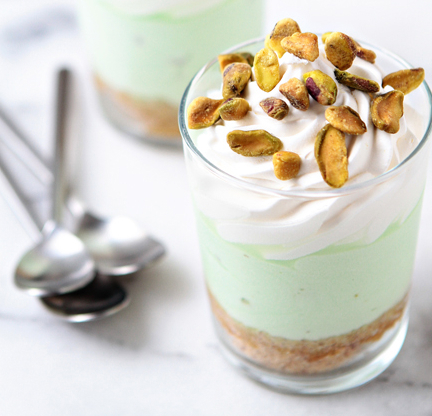 If you don’t mind a little more mixing in the kitchen, go ahead and make pistachio pudding from scratch for the filling. Whether you’re entertaining guests or just fulfilling your own sweet tooth, the extra effort will be appreciated. 1. Melt the coconut oil or butter, and mix in a small bowl with the crushed ’nilla wafers and a half-cup of chopped pistachios. Divide evenly among 8 glass jars, and press the crust mix firmly into the bottom. 2. In a mixing bowl, beat the cream cheese until it increases in volume, becoming light and fluffy. 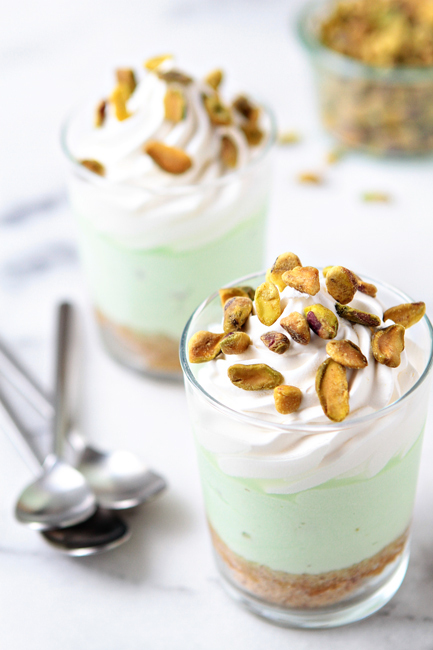 Add the pistachio pudding mix and milk (or substitute an equal amount of prepared pistachio pudding), the remaining chopped pistachios, and thawed frozen whipped topping. Mix all ingredients together with a heavy spoon until the filling is smooth. 3. Spoon the pistachio pudding mixture on top of the crust, adding an equal amount to each jar. Cover, and set in the freezer overnight, or a minimum of 5 hours. 4. Before serving, prepare fresh whipped cream for the topping. With a whisk or electric mixer, combine the heavy cream, powdered sugar, whey isolate, and vanilla extract. Continue whipping until enough air is incorporated for the whipped cream to form soft or stiff peaks. 5. Remove the jars from the freezer, and top with whipped cream. If desired, garnish with additional pistachio pieces. Enjoy!